Welcome to the latest piece of content in the Podcast section on my website! Throughout 2018, I have been a part of various podcasts and interviews on live tv, radio stations and well-known podcast programs. I know that it can be hard to watch/listen to something live, so I wanted to create a podcast option on my website so that you can find all of the great content I have been a part of, and watch at your own convenience. The latest piece of podcast content I want to share with you was with Steve Hyland at The Business Connections Live studio. I first met Steve many years ago, and did a small segment for Business Connections Live at The Business Show. Following on from this, Steve invited me to be a part of one of their 60-minute live shows, which was great and I spoke about the first edition of Think #Digital First. Steve and the team at Business Connections Live reached out to me a couple of weeks ago, and invited me back onto the show which of course; was something I jumped at the chance of being a part of. We spoke briefly, and I knew immediately what I wanted to talk about, and share with their audience. I first spoke about this topic in an article on Think Digital First, and wanted to give more of an insight into the “why”. As a Digital Transformation coach, I found that statistic quite worrying for small businesses, and wanted to share this, and help small businesses understand the importance of a Digital Transformation, and why avoiding this, may mean your business will not survive past 2020. 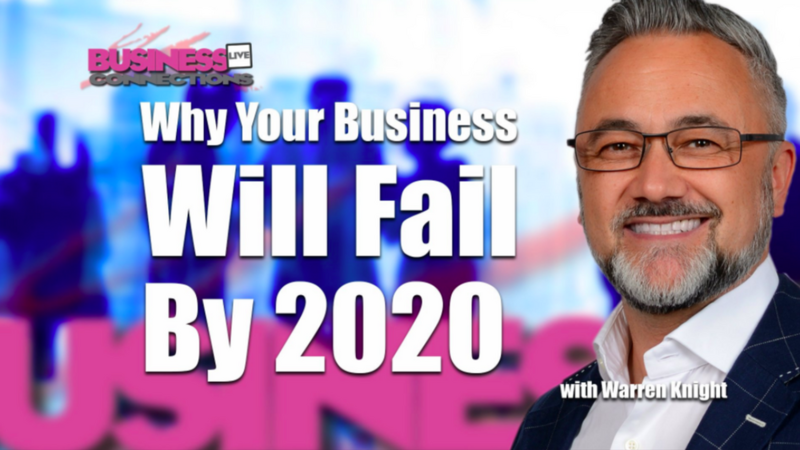 On this edition of Business Connections Live with Steve Hyland, I take you through the importance of a Digital Transformation, as well as how to do your industry and competition research, understand your target audience and create a strategy that is consistent with your online message. I am also going to be talking about the second edition of Think #Digital First and why I wrote a second edition. One action that will guarantee your business will not fail by 2020 (if applied on a daily basis). If you would like to watch this 70-minute tv program, you can do so below! I would love to hear your thoughts around the Business Connections Live interview, and what you would like to see more of, from me in the future.